I’ve mentioned it in the past and it bears repeating: blogging continues to surprise me in ways I never dreamt possible. One need look no further than my dining room table to see what I mean. There, in jars of all shapes and sizes, you’ll find preserves, jams. jellies, pickles, pickled peppers, brandied figs, apple sauce, corn relish, and ketchup. You may recall that I was the guy that swore he’d never can anything. Now it looks like I’m stocking a bunker for a nuclear holocaust. Look closely, however, and you’ll soon find the Belle of the Ball … well, Ball Jar. I’m talking about the ketchup and that’s the recipe I’ll share today. 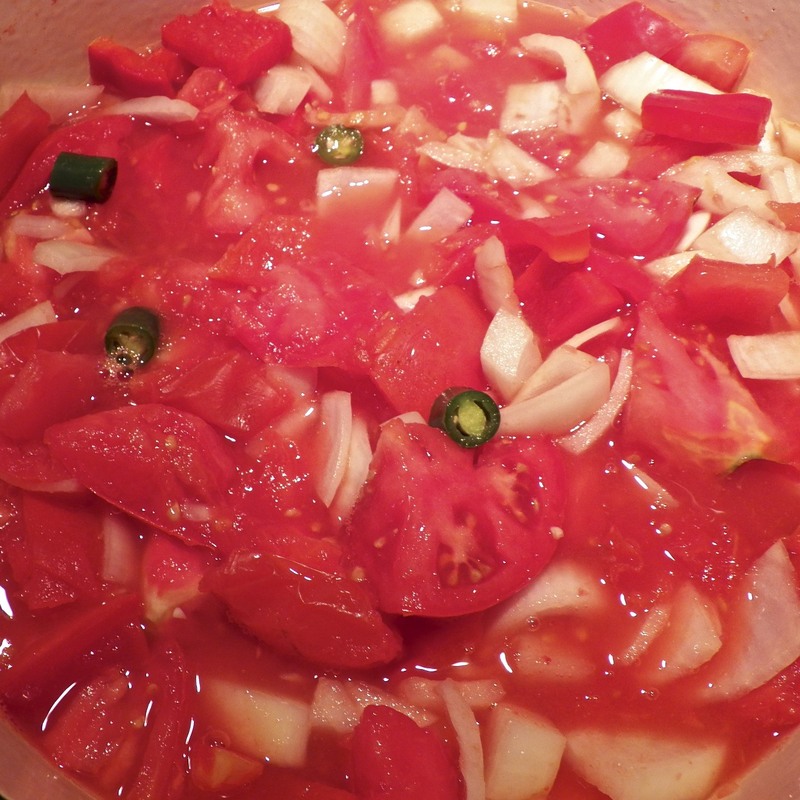 Way back in September of 2011, my blogging friend Tanya, of Chica Andaluza fame, posted a recipe for “Up The Mountain Spicy Tomato Ketchup.” With this area’s farmers markets still flush with tomatoes, I bought a couple pounds and decided to give her recipe a try. Knowing how spicy things can get up that mountain, however, I did tweak the recipe to cool it down just a bit. And the result? This is one exceptional ketchup. In fact, it hardly seems right to call it ketchup for this isn’t at all like the bottle of red stuff on your grocer’s shelf — and that goes for all 57 varieties! Tanya’s sauce is so good that I actually felt like I was wasting money the last time I was without and needed to buy ketchup. But don’t just take my word for it. I’ve given jars of Tanya’s ketchup to friends and family alike, all of whom, without exception, sing its praises. And to all of my fellow Chicagoans, this ketchup is good enough to be served on a hot dog! Yes, it’s that good! There’s only one possible issue worth mentioning. It is best to simmer this sauce slowly and to stir it frequently. If you don’t you could end up with a splattered mess or, worse yet, a scorched pan bottom. A splatter screen may help prevent the mess but a scorched bottom can ruin the entire batch of ketchup. If you suspect that the ketchup has begun to burn, do not use a spoon to scrape the bottom of the pan. That will only foul your ketchup. Better to dump the pot’s contents into a large bowl and clean the pan’s bottom before re-filling it with the ketchup and continuing the simmer. Bear in mind, the lower the simmer, the longer the time required to get a thick, rich ketchup. For me, this job will easily last a full afternoon. Use a piece of cheese cloth to form a pouch into which you’ll add the cinnamon sticks, allspice, cloves, mace, celery seeds, peppercorns, and bay leaves. Use butcher string to enclose and securely tie the herbs & spices. Set aside. Place the tomatoes, onions, peppers, and garlic into a heavy bottomed saucepan over med-high heat. Bring to a boil, reduce to a simmer, and cook until the ingredients are all soft, 30 to 45 minutes. Once the tomato mixture has softened, pass it through a food strainer, food mill, or fine meshed sieve to separate peel and seeds from the pulp. Return the strained pulp to the saucepan, along with the brown sugar, mustard, paprika, cider vinegar, and spice pouch. Stir to combine over med-high heat. Bring to a boil, reduce to a simmer, and continue for 45 minutes, stirring occasionally to prevent scorching. Remove the pouch. At this point, continue to simmer until the ketchup has reached the consistency you prefer. This could take anywhere from 30 minutes to several hours. Once it has reached the desired thickness, add cayenne pepper, ground nutmeg, and salt, to taste. Once the seasonings have been adjusted, you can either bottle it for storage in the refrigerator where it will keep for about a month, freeze it, or, you can process it in a boiling water bath for 35 minutes if using pint jars and 40 minutes if using quart-sized canning jars. You may have noticed that the spice pouch was removed after simmering for 45 minutes. That’s because the tomatoes will continue to reduce for some time afterward and that will serve to concentrate all the flavors in that pot. To leave the spice pouch in the tomato mixture for too long could render the ketchup inedible. You can always adjust the seasoning at the end of the cooking, just as one does with the cayenne, salt, and pepper. Living as far North as I do, finding good tasting tomatoes from now until Spring is pretty much impossible. Even so, I’ll still use off-season, or even canned, tomatoes to make ketchup during the Winter and Spring months, adding tomato paste to boost the tomato flavor. Although this version may not quite equal the taste of ketchup made from Summer’s best, it is still leagues ahead of any ketchup you might buy at a store. In September, Marie posted a link to a recipe for tomato jam that used yellow heirloom tomatoes and basil. I spoke to Zia about my intention to try my hand at making the jam and that triggered a memory of Grandma making tomato jam when Mom & Zia were little girls. Grandma’s version didn’t use basil and, though the tomatoes she used would be considered “heirloom” by today’s standards, back then they were just “tomatoes.” Well, in an effort to bridge the gap between New and Old, I made tomato jam that weekend with yellow heirloom tomatoes but without the basil. And the result? Like almost all the jams I’ve made, it goes very well with goat cheese. (Is there a jam or preserve that doesn’t go well with goat cheese?) Not only that but I was surprised to find out just how good it worked as a glaze for barbecued chicken. Next time, though, I’m adding a few red pepper flakes and a dash of hot sauce to the glaze. Of course, you can always serve it like my Grandma did for her girls: on a chunk of Italian bread. As a boy, vegetables were very much a part of my family’s diet. Whether picked fresh from Grandpa’s garden or selected at a grocery or market, you could count on a salad of fresh greens and at least one vegetable being served at every dinner. Mom’s favorite, and frequent star at our supper table, was Swiss chard. Mom enjoyed it enough to commandeer a small patch of Grandpa’s garden so that she could grow her own. Now that’s some serious chard love! Very often, Mom would use a combination of chard & spinach to fill small pies, cacioni, from a recipe that came from Dad’s homeland, San Marino. Click HERE to check out the recipe for this family favorite. This entry was posted in Condiments & Snacks, Vegetarian and tagged Food, Italian, ketchup, Recipes, Tomatoes by ChgoJohn. Bookmark the permalink. I must have missed this recipe of Tanya´s, so I am extra glad that you have posted this today. It never fails to be amaze me how versatile such recipe variations are, when they get spread as a glaze over meats and chicken or added to pasta to make a sauce. Hello, Marianne! I use this recipe more than any other that I’ve gotten off the web. Once you make and taste it, there’s really no earthly reason buy ketchup again. There’s really no comparison. Blogging has really had an impact on the way I cook. It certainly has broadened my horizons and, yeah, I’ll experiment with things and failures are pretty rare. That’s because there are some very talented cooks writing blogs and I continue to learn from them. I’m going to have to make that ketchup. I’ve only just realised that I haven’t had a shop bought tomato ketchup or sauce in my kitchen since we moved to France. Sadly, this year was the worst year for tomatoes since we moved here. Roger, this stuff is good, really good. Even if you use “tinned” tomatoes, your ketchup will be far better than any you’ve bought. I used them last Christmas, gave away that entire batch of ketchup, and no one noticed a difference. Give it a try; I doubt you’ll be disappointed. Loved the recipe. I have tried to prepare a ketchup before. But , this looks so good. Thanks for sharing. You’re welcome. Tanya hit this one out of the park and I hope you like it. Thanks for stopping by and commenting. Thanks, Charlie. This is one pot you really do need to watch. The thicker it gets the easier it will scorch and you don’t want to burn it after a day of simmering. This ketchup, though, is so flavorful that I don’t mind babysitting the pot at all. IT is so completely different than any I’ve ever had — and so much better, as a result. I’m so excited about this recipe, My mom friends and I were talking about how to make our own ketchup for our kids. My middle son, has to have ketchup on everything! I’m sure I can tweak the spices to a 6 year olds liking. How is it when you freeze it? Does it change the consistency? Thanks, Lisa. I’ve not frozen it, Lisa. I process it in boiling water and “can” it. I’ve checked other sites and freezing is a recommended method of storing it. I’ve noticed that, after time, a little water will separate from the ketchup but that happens with most store brands. I just stir/shake it back into the ketchup, no harm done. Though not really spicy, this still does have a little kick to it. I’ve not given any of it to children but it would be easy enough to make a batch without the “hot” spices and peppers. If you make it I hope you — and you son — enjoy it. There’s one I haven’t made but will put it on the list! Sounds really great! May have to try your tip regarding off season tomatoes. BTW – I am tickled you have been converted to the dark side! I admit it. I caved! Hi, Maria! Ketchup is a mainstay for most families with children and my family was no different. We put it on everything, much to my Dad’s dismay. 🙂 I’ve not given this to children, though, because of the spicy element. The recipe could be easily adjusted for younger palates. Now if I can get my children to eat this instead of the store bought variety! During the colder months we have a lot of hot house tomatoes. Do you think they would work as well? Hello, Colline. This is quite a bit more flavorful than “regular” ketchup. Some kids may not like the change but I’m sure all of the adults will. We cannot get “good”tomatoes here until well into next year. If I do use those that are available, once they’ve been strained, I’ll add some tomato paste to bolster the tomato flavor. The result is just about as good as using fresh tomatoes picked at their peak in Summer. Next time you do the ketchup, try using the crock pot. Less chance of scorching. Just prop the lid with a wooden spoon, and let it go until it’s the right consistancy…I made tomato sauce like that all summer! Thanks for the shout-out! Hope your jam is wonderful! I think you should convert a bedroom into a pantry and storage space for food prep items! Just don’t let Max in there…CLANK! I’m here to help. Never doubt that. Exactly, Teri. It is far and away the best ketchup i’ve ever tasted. Uh oh. Ravioli!!!!!!!!!!! We haven’t made any in a while and I’m really looking forward to that one too. Yum! It’s been a busy week. Sarah. Last weekend was devoted to ketchup making and I made 2 batches. It is soo good and unlike any other. If you’ve a crockpot, as Marie suggested, it will eliminate the need for some of the pot stirring. Be sure to prop the lid open so the liquid will reduce over time. Ah John – thanks for all the kind words! We love this ketchup but didn´t get to make any this year 😦 so I am pleased that you think it´s worth the effort and have been enjoying and sharing it! Tanya, your ketchup has spoiled me. Since I made that first batch last year, I’ve only bought ketchup one time, and that was about a month ago. I’m not much af a ketchup user but this is so different that I use it all of the time. We — myself, friends, and family — all thank you for the recipe. I have never canned anything, and now I feel inadequate and naive. Seriously, I have some problem with canning, not sure why it intimidates me. Keep in mind I live around autoclaves and sterilize stuff daily, somehow canning and the boiling of the jars and all leaves me paralyzed. Go figure. I know what you mean about canning, Sally. I only started in the Summer of last year. I admit, though, that now I’m hooked. I see fresh berries at the farmers market and all I can think of is jam & jelly. I went way overboard this year. I finally put a stop to it by refusing to buy any more jars. It worked! I’ve done any canning, I guess I’m too lazy, but I really think I should change that! Your posts have been inspiring! I love ketchup, but never thought to make my own. It’s such a vibrant color! Love that you can control the salt. I love the peppers! You just mentioned the greatest advantage of making your own ketchup, Tanya, it’s the control. You can make it as sweet, spicy, or salty as you want, without using corn syrup or preservatives. And the result is a rich, multi-layered flavor. Give it a try! Just wondering, after the saucepan with the strained pulp etc. comes to a boil, why not put the saucepan over a pot of boiling water (making a double boiler) to continue cooking. This would eliminate the scorched pan bottom and hopefully the splattering mess as well. Would most likely take a lot longer to reach desired consistency though. As the lucky recipient of two jars, I can attest to the extreme deliciousness of John’s ketchup! Thanks, Jack! The spice combination sounds so good I can almost taste it! I was surprised to see that sugar was not on the ingredient list, (store bought ketchup is loaded with sugar) so that makes it more appealing to me right there. Honestly, we hardly ever even use ketchup … well until we welcomed our German exchange student. She puts ketchup on everything, at least all meat, even blackened salmon! (That was hard to watch.) She might like a new flavor of ketchup to try … we shall see. Well, now I see it–dark brown sugar–I guess I should have had a second cup of coffee this morning before blog reading…geez. Yes, the ketchup thing is a little strange, and yes, even beautifully grilled steak. We just shake our heads. Ketchup – what a great idea for gifts. Who doesn’t use ketchup. Looks like I’m going to need to check out Tanya’s blog as well. One of the things I love about your blog is your willingness to tackle so many everyday things from scratch — like your mozzarella and ketchup. Now, we all eat these things store-bought as well since we only have so much time. But isn’t it a treat to make and enjoy these everyday items when made from scratch? Still looking for a chunk of time to tackle that mozzarella…..
John, I’m not a big fan of Ketchup but this looks worth trying! 🙂 There is a lot of flavor going on in this ketchup. Hello, Richard. This ketchup is unlike any you’ve had. There’s a real depth to its flavor and I use it far more frequently than the store bought stuff. So very glad to read that you tried and liked this ketchup. It’s so flavorful that it almost sounds a disservice to call it ketchup. I’m sure yours must have been a bit more spicy and I cannot wait to see your post. Thanks, Richard, for coming back to tell me of your experience. I may have accidentally cleared it Thursday when I was in Michigan. I was in a wifi spot and tried to clear my inbox. Thanks for the heads-up. I’ll search for it and correct my error. Funny you should mentioned, I was thinking exactly the same another day: we also grew up eating a lot of vegetables, all year round, I even started to write a post about our family vegetable eating traditions. Hello, Marina. You’re going to love this ketchup and can adjust the “heat” to suit your family’s needs. Earlier in the comments, Marie suggested using a crockpot and to use a spoon handle to prop open the lid to let steam out so the sauce reduces to make thick ketchup. This certainly would solve the scorching problem. 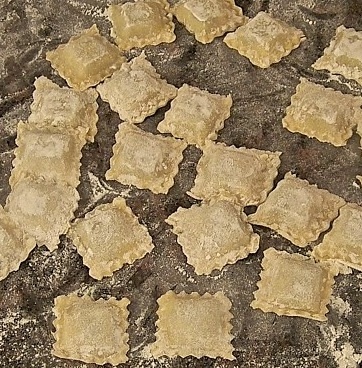 I will include some info on ravioli makers in my post about making sausage ravioli, heaven knows I have enough of them. My preference are the raviolo dies/forms. You can see my Zia use a large one to make ravioli by clicking HERE. The sausage ravioli I made that are pictured in today’s post are almost half the size that she made. Thank you John! I’ll be waiting to see your ravioli post with all your “tools of the trade”! It is never boring to see what people use. I am on a lookout for a ravioli maker, but I want the round shape. I just love my ravioli round, although I know they come in square shape most of the time. I didn’t know you have to puncture the meat filled ravioli, something new to me. Thanks for this detail, I will definitely try to do it next time I am making ravioli. You amaze me John, the canning, preserving and such are amazing. I’m not a huge ketchup person, but my brother and his kids are…this may be just the home made presents I was looking for. As well, there are a number of recipes that use ketchup in the ingredients (BBQ sauce for example) that would totally benefit from this upscale version. I have to admit, I am not a huge store bought fan because of the sugar content (high fructose corn syrup, corn syrup) but yours has a reasonable amount for the volume. I just adore that gorgeous colour that tomatoes cook down to. There is no down side to making your own ketchup, except maybe eating too many hotdogs and hamburgers! I’m not much of a ketchup person either, Eva, but this is something different. I use it far more than I would store bought. I included a jar of it in my gift packages last year and everyone loved it, though there weren’t any children involved. Although not super hot, there is a little kick to this but you can easily moderate that by reducing/omitting the chilis and cayenne pepper. I hope your brother and his family enjoy it. I’m now craving a hot out of the pan, crispy batch of homemade fries to go with your glorious ketchup. This sounds like the perfect condiment and tomato jam became my new best friend all summer on just about anything…especially on the side of an omelet. Yum! Tomato jam is new to me but what a great surprise! I didn’t make much this year and I’ll be at least doubling that amount next Summer. It is too good not to. What an amazing sounding ketchup! Love the generous mix of spices in it! Thank you, Celia. Those spices really give this ketchup a deep, rich flavor. Yum! But I do need to say how good the ketchup looks and sounds, are you the canning King? I’m off to check out the swiss card recipe. I may have to take my canning equipment to Maine next summer. I always have so many wonderful tomatoes from the garden but I have resisted all the wonderful canned tomato recipes simply for lack of space at our cottage. I don’t think it would matter much if you didn’t have any mace. Believe me, this is one flavorful ketchup. I, too, thought of using it to make barbecue sauce. It sure would make a better base than plain store bought ketchup. Thanks, MD. This recipe is all Tanya — and it is fantastic! Ah yes, I remember this terrific sounding ketchup and just looking at it makes me want to have some! And thank you for saying you can make it year round using non-seasonal or canned tomatoes, as that was a question in my mind until I saw your note about it. Hmmm. I may have to try my hand at this for Christmas presents! 🙂 Also love the spinach and chard calzone idea. I’ve made them with kale but not chard. A post chocked full of great ideas, John! Thanks, Betsy. I tried Tanya’s recipe just to see how it would taste. I’d no idea I’d be making it year-round. When I emptied my last jar last Winter, I tried using canned tomatoes with a little tomato paste and it was very good, too. I use canned whole tomatoes because so many of the diced and puréed have additives and preservatives. This sauce gets quite concentrated and I want to control the spices in it. Another blogging friend, Marie, mentioned using a slow cooker to avoid the scorching problem. She mentioned using a spoon handle to keep the lid open a bit to allow for evaporation. I’d try it but I gave my slow cooker away last Spring. Time to get a new one, I guess. No matter how you go about making it, I ber you’re really going to enjoy this ketchup. It is unlike any that I’ve ever bought. When it couldn’t get any better; you prepare homemade ketchup. The recipe is amazing John! Every single ingredient together sounds so good. I would never be able to have store bought again. 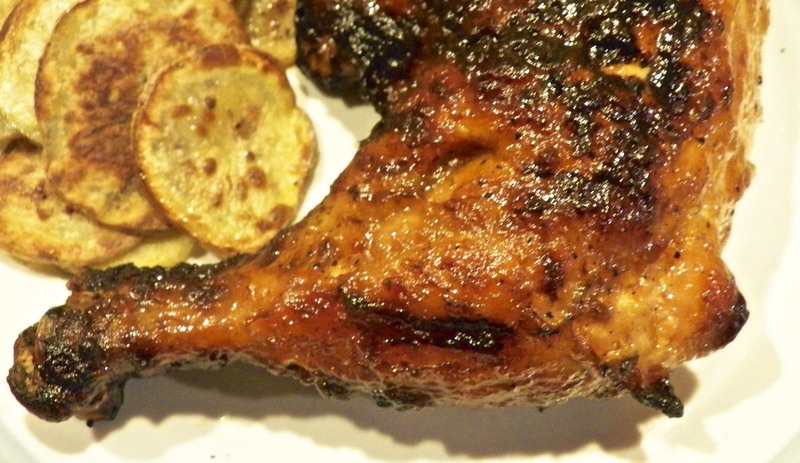 The grilled chicken looks delicious! And how did you know that I have been craving raviolis? These look delicious already; yum! Who would have thought that one of the advantage to starting a blog would be to discover a great ketchup? But I did and this is one mighty fine ketchup! That tomato jam was a surprise, especially learning that my Grandmother made it some 80 years ago. As for the ravioli, I start craving it every year around this time. It was our primo piatto for every holiday dinner and I looked forward to it more than I did the turkey. Today, whether or not I’ve got a crowd on one of the holidays, I’ll be sure to have some ravioli at some point during the day. It just wouldn’t seem right not to. Thank you, Judy, for always leaving such great, encouraging comments. After this, simply cannot wait for the tomato-glut season to arrive in Australia! OK, not the first thing I reach for in fridge/pantry but so ‘usable’: love making anything like this on my own! So, bookmarked, and a huge ‘thank you’ and I’ll tell you in about four months time if i ‘don’t like it’!!! Hardly likely! Oh, the blessedness of blogs 😀 ! Thanks, Eha, and I’m sure you’ll like this ketchup. Tanya is a very talented cook and this is further proof of her skills in the kitchen. You’re right about the “blessedness of blogs”. It is a world full of surprises. Did not have time yesterday to read all the comments: am smiling at the moment!! Remember a ‘delightful’ birthday party for one of my daughters, guess about 8 at the time. Too many kids invited and this Mom did not have eyes in the back of her head: When I did get to look around was somewhat horrified to see the ketchup from the baby sausages being ladled in big amounts on the rich chocolate birthday cake !! OK, remember only one little, one with her head in the toilet basin afterwards 😀 !!!! Oh, Eha! That tale has me chuckling. How lucky only one of them had an upset tummy! It could have been far worse. Ketchup on chocolate cake. That’s a good one! I have several canning friends who will make your recipe. 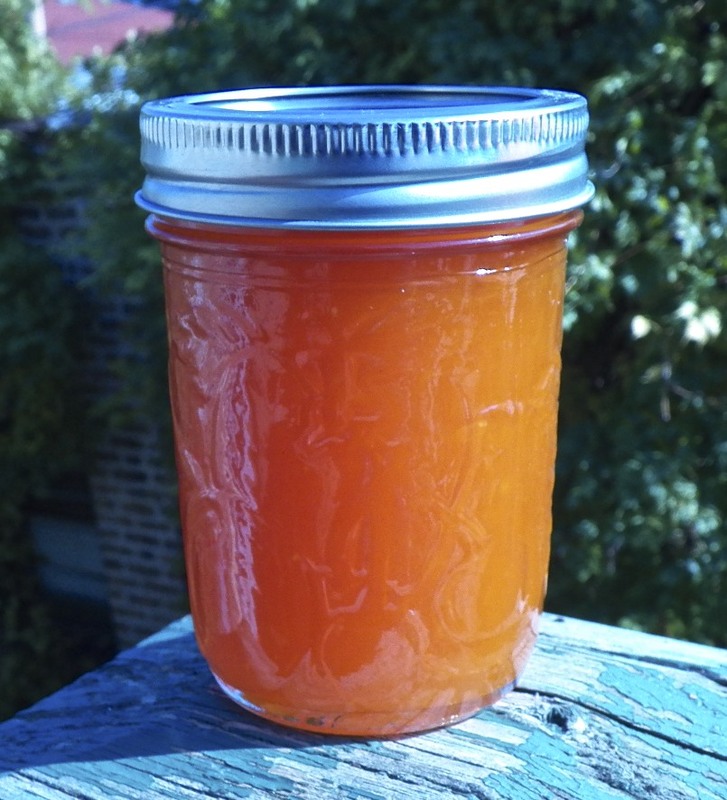 My parents loved yellow tomato preserves (sans basil) and gooseberry preserves and the like. My sister made chutney with yellow tomatoes, too. Goat cheese and preserves sounds perfect for an upcoming dinner party. As always, I enjoy Wednesdays cause it means I will get to read your blog and be enticed by the photographs. Love the upcoming teaser feature, too. Oh how I will miss summer’s juicy fresh tomatoes this winter. Nothing else will do! Thank you so much, Ruth. I already miss those great tasting tomatoes of Summer. I’ve switched to cherry or sun-dried tomatoes but they can hardly compare to a fresh, ripened on the vine, beefsteak. Until I mentioned Marie’s jam to my Zia, I’d no idea anyone had made tomato jam in my family. I think Zia was as surprised by the memory as I was to hear it. I can’t wait to hear what you think of this ketchup, Barb, and whether it passes muster with your Son. (Note I didn’t write “mustard”.) It’s certainly not something you’re going to get in a foil packet from MacDonald’s. This is definitely more of an adult ketchup. Now, where do you get imported tomatoes that taste good? Ours are imported but they seem to be picked green and ripen on the way here. The result is more cardboard than tomato. I stopped buying them a number of years ago. Maybe it’s time I sample a couple from each of my fruit markets to see if things have changed. I miss having a tasty, sliced tomato in my salad occasionally. You know, I’m not one to use much ketchup either but this sauce is a game changer. I use it much more frequently than I’ve used store bought in years. It’s like the difference between a run-of-the-mill yellow mustard and a brown grain brown mustard. Yes, they’re both mustards but they are miles apart in flavor. Slow stirring and love is what makes this recipe special. I am sure if I had one bite of this I would never go back to the stuff in the grocery store. I think that is a good idea to use canned tomatoes when the tomatoes are out of season as it would give the sauce good flavor. I can’t wait to read the recipe for your sausage ravioli. Delicious! Thanks, BAM. The ravioli are coming! I was not kidding when I wrote that I felt that I was wasting money when I last bought ketchup. Tanya’s ketchup is just so much better. And I was happy when my “experiment” with canned tomatoes worked so well last Winter. I shall never go ketchup-less again! I was looking for a good homemade ketchup recipe and this may be it! Thanks for sharing. Most of the work will go into shopping for the ingredients — what a long list! I’ll make this for my homemade junkfood party coming up in December. I agree with you, Stefan, this is about as long a list of ingredients as I’ve ever used — but the end-result is so very worth it! I hope you do try the recipe. I know you like to tweak recipes — don’t we all 😉 — and I’m anxious to see how you would customize this one. The longer I’ve been cooking, the less I’ve been following recipes to the letter. I’ll have to use canned tomatoes. What is dry mustard? Is that mustard powder? Can I substitute regular mustard? I don’t think I can get serrano peppers, and not sure about jalapeños either. I will sub regular red chile peppers, and probably won’t use a lot of those as the whole point will be to make a home made from scratch version of well-known foods, so it shouldn’t be too different from Heinz. Hello, Stefan. I usually follow a recipe verbatim the first time and then vary it the second time around — unless it calls for an ingredient that I don’t like. I’m guessing what we call “dry mustard” is what you call “mustard powder” and I don’t see why you couldn’t just add some mustard to the pot. I chose Serranos and jalapeños because I cannot get fresh red chilis like you Europeans get. We cannot get good fresh tomatoes during WInter so I’ve used canned without any problems. This recipe is not intended to duplicate Heinz, Stefan, and you’ll be disappointed if that’s what you want. This is far more flavorful than Heinz and the chilis do give it a bit of a kick. For my tastes, it is far more preferable over any that I can buy from a store. I don’t want to replicate Heinz — it would be a bit silly to go through all that trouble without an advantage over buying a bottle. But I don’t want something either that is so different from ‘normal’ ketchup that my friends will not recognize it as ketchup. I’ve made this and liked it, but next time I will use less chile peppers as it was too hot even with the seeds removed and without adding cayenne pepper at the end. I ended up adding more tomato puree to cool it down, but I can tell that this is a very good recipe that I will definitely make again. Thanks for sharing! I’m glad, Stefan, that you tried and liked this ketchup. It has such a rich, deep flavor profile that I now avoid buying store-bought. And you’re right, the heat level can be easily modified. That’s why I used the Serrano and jalapeño peppers. I thought red chiles would be too hot for me. Thanks, Stefan, for coming back to tell me of your experience with the recipe. Hi John, just made another batch, and noticed that in the recipe it is not mentioned to add the mace to the pouch with the spices, and it is also not mentioned when to add the pouch with the spices. I will be doing a post on this soon. Hi, Stefan. Good catch! I follow this recipe on my iPad every time I make ketchup and never once caught the errors. That’s the problem when writing a recipe you know so well. Thanks for taking the time to let me know of the omissions. This all looks great, especially the yellow tomato jam. I’m sure it does go well with goats’ cheese as our green tomato jam does. The ketchup is so different from my idea of the stuff that comes from supermarkets – and that I never buy! Even here in the Mediterranean we can’t grow tomatoes in winter – you can buy artificially force-grown ones, grown in polytunnels, but I never do. I prefer to enjoy the summer crop that has been preserved in jars and wait until next summer for the real taste of fresh tomatoes again! Thanks for leaving so nice a comment. I’m not accustomed to cooking or preparing green tomatoes. In my youth, picking a tomato before it ripened was a punishable offense in the Court of Grandpa. 🙂 Your green tomato jam really caught my eye, though, and next year, I’m going to definitely give it a try. I so agree about off-season tomatoes. Ours are picked green and shipped cross country to us. Very often they’re treated with gas to speed the ripening process along the way. The result is something with very little taste. Like you, I’d rather go without. Yes, a crock pot would work, as Marie suggested earlier. First, though, one would have to purchase one. I gave mine away last Spring and have yet to replace it. I have to say that I have never thought that I would even consider making ketchup. Mum’s friends have sent us jars of homemade ketchup but I was never impressed. 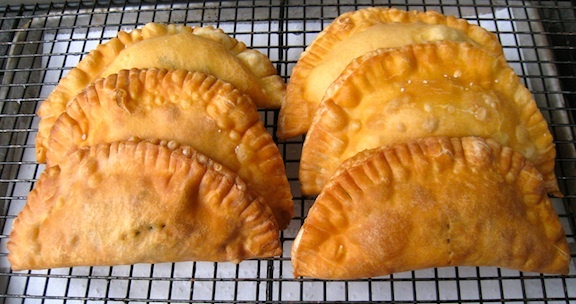 Now a recipe that you swear by John has more than sparked my interest! Since making Tanya’s recipe, I’ve looked up other recipes on the web and there are many. Few, however, have her mix of spices. I think you could easily omit the chilis and cayenne pepper to make a more mild ketchup without sacrificing too much flavor. You can always taste it near the end of the simmering and adjust it to suit your family’s tastes. With or without the chilis, Sawsan, I doubt you can buy anything like this ketchup. I hope your family likes this as much as my friends and family do. Hey, I remember this sauce over at Tanya’s and it is an absolute winner – a love filled recipe by spending the day in the kitchen keeping a close eye on it to ensure it doesn’t burn. SCRUMITY! And I remember your Guinness mustard, Mandy. Together, your mustard and Tanya’s ketchup helped to make it a “Condiment Christmas” last year. Thank you, Mar, for leaving such a nice comment. You’ve got me thinking. I wonder if I would have liked this ketchup 20 or so years ago. Like you, my palate has changed a great deal and this tastes nothing like the red goop in the bottles on your grocer’s shelf. I bet you’ll like it and, if not, you’ll know what to change to make it more palatable for your tastes. Give it a whirl! And fear not, Mar. The ravioli are coming! The ravioli are coming! I just don’t have enough time in the day to do all that I’d love to do!! But you’ve made this sound so good and something I just have to have…that I think I’ll set aside a Saturday afternoon and make some! Afterall, I can freeze it…because I’ve not yet gotten into the canning act! Maybe one day since you’ve done it, I might as well too! So you remember how adamant I was about not canning, eh, Linda? Well, once you cross over, there’s no turning back. 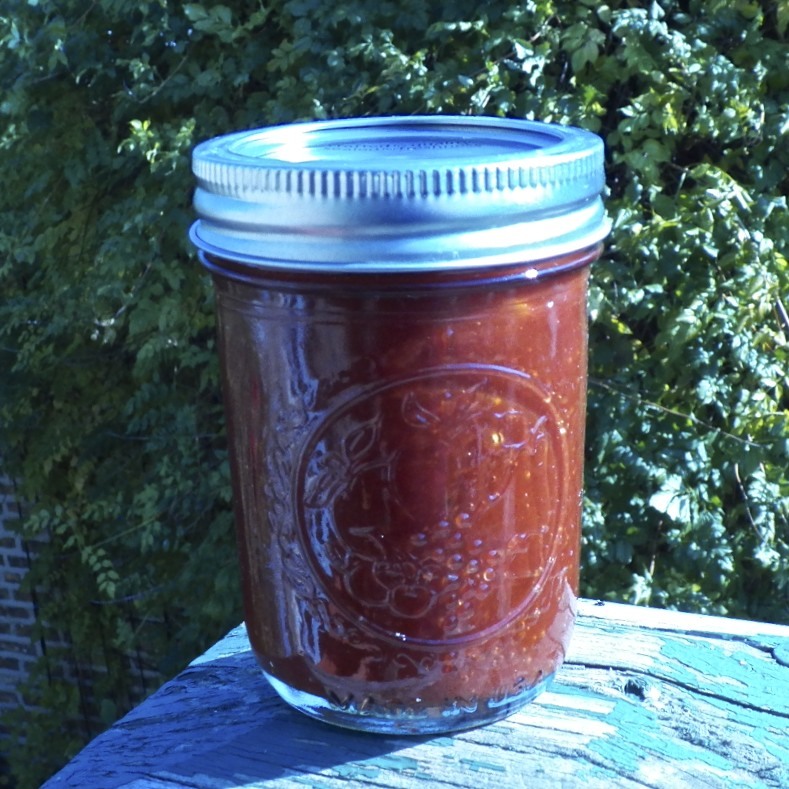 Canning really is very easy to do and you’ll be able to do it without any problems. I need to get myself a slow cooker so that I can make this ketchup without having to babysit it. On the stovetop, you really have to keep an eye on or it will scorch. I have to say, though, the end-result is sure worth the effort. It is surprisingly good and certainly healthier than the corn syrup-laden store bought alternatives. Given you knack for spices, Linda, I bet you’ll make a very tasty ketchup. Guaranteed! Admittedly, I have a hard time imaging a ketchup better than Heinz, but I’m intrigued enough to try this recipe. Will follow your suggestion of cooking it in the crockpot. Thanks for this suggestion! I can’t wait to try it. This is about as far removed from ketchup as brown grain mustard is from the yellow stuff. All of the spices give this a depth of flavor that is a pleasant surprise. It really has spoiled me and I hope you enjoy it. I agree, Susie, and I love finding recipes like this one, where I can make a normally store-bought item in my own kitchen. It is surprising how much better the home-made item is! We have given up so much flavor for convenience. SInce I have the time these days, I might as well make whatever I can. This ketchup is a little spicy but nothing that will ruin your palate, like some hot sauces will. I’m not a fan of very spicy foods so I think you and I have similar tastes in this regard. I doubt that you’ll have a problem with this. You’re very welcome. This is a ketchup like no other and I hope you’ll enjoy as much as we all do. Thanks for dropping by and taking the time to comment. I was so excited to see this post. I wish there were fresh tomatoes available (other than those cardboard ones that they try to pass off in the winter). I would love to give this as a Christmas gift. Maybe next year. A local restaurant here serves smoked tomato ketchup that is so good I think I could bathe in it. I am sure this will be just as tasty. 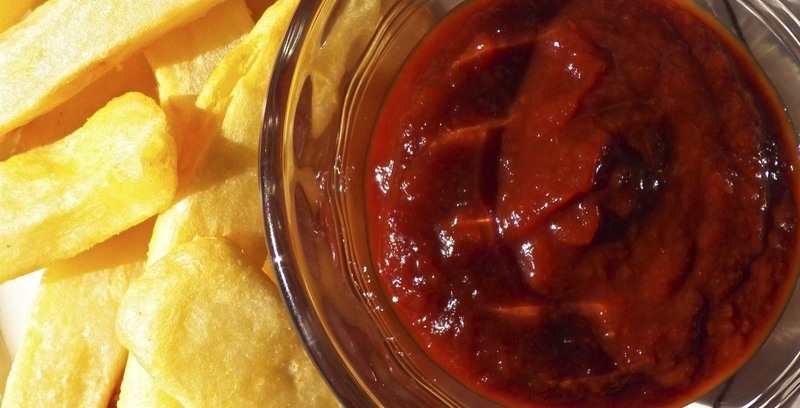 You can make this ketchup with canned tomatoes. I used them last year and gave the ketchup away as part of my Christmas baskets. It was very good and no one seemed to mind. I added a little tomato paste to the mix but don’t think it was really necessary. I think you can use a slow cooker, Celi. In fact, Marie suggested doing that and using a spoon handle to prop open the lid to allow it to reduce. Believe me, when I get a new slow cooker, ketchup will be one of the first things I make in it. Tanya has a winning recipe here. This is one good ketchup! I’ve read how wonderful homemade ketchup is, but have never really considered making it. We use all of maybe two bottles a year, and are OK with the 57 variety stuff. But I have to say this is really tempting! Sounds like the flavor is out of this world. I’m one of those who always swore I’d never can, but I feel like I’m being drawn to the dark side. Or at least the Ball-jar side. 😉 Good stuff – thanks. Ketchup goes well with everything! I will be needing this recipe for life!!! It certainly changed the way I feel about ketchup. I hope you enjoy it!